This week, the passengers of the two most popular public transit systems in the country got some really bad news. 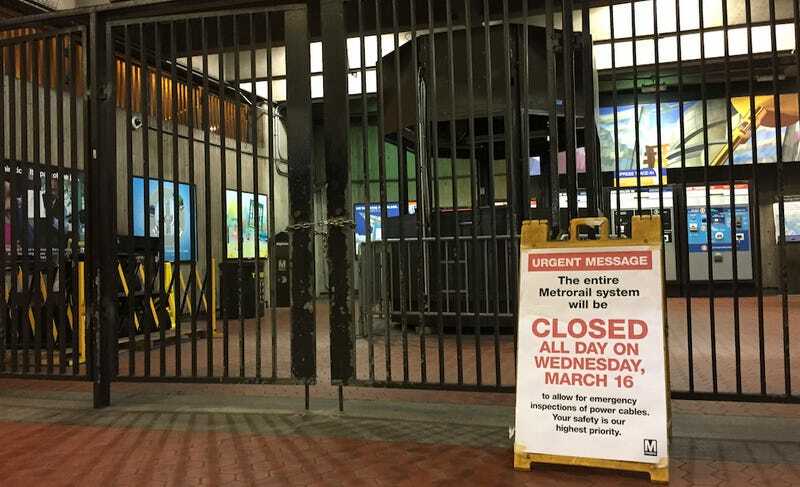 Parts of both the Washington, DC and New York City subways will be closed for repairs to their aging infrastructure over the next few years, stranding many without any viable transportation options. For DC, the news was dire, although not altogether unexpected. Fifteen different projects focusing on various overhauls of electrical, ventilation, and safety systems will require station closures and “single-tracking” (meaning trains will have to share a single track, slowing service significantly). Some lines will see closures of up to a year. Good thing DC already got a trial run of what this might be like. In New York, it was determined that the L train tunnel connecting Manhattan and Brooklyn needed an immediate upgrade because it would almost certainly not survive another flooding event like Superstorm Sandy. The city at least tried to make the closures of the L train fun, turning them into a bizarre “which would you rather” game: Would you rather have a complete closure for 18 months or partial closure for three years? There’s not much I can say to make this better, especially as a resident of Los Angeles, where our shiny new Expo Line is about to provide glorious light-rail service from downtown to the Pacific Ocean. But I did find one comforting statistic: Moscow is about to finish its gigantic subway expansion early, with 76 stations on target to open by 2020. A straphanger can dream. Or, if all else fails, emergency gondola?